Further down his newsfeed was a compliment for another friend from an account called “TJ Compliments,” for Thomas Jefferson High School. By midnight, Hanfling established an account for his school, Walt Whitman High in Bethesda, Md., a public high school of about 2,000 students. By the next evening, about 300 compliments had been submitted to Hanfling – at that point still an anonymous administrator – who in turn posted them. Those receiving the compliments were tagged in the post, but they didn’t know their flatterer. 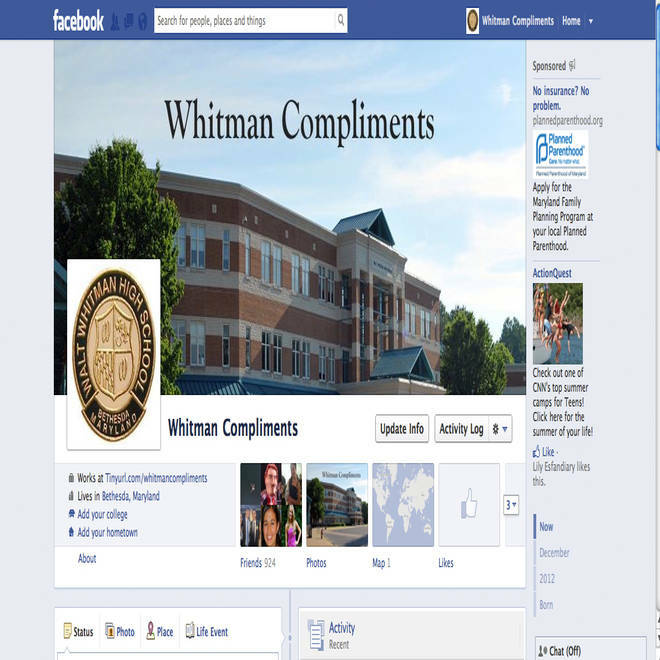 The Facebook page "Whitman Compliments" was inspired by Queens University Compliments in Canada, created in September. Students submit compliments, which are then posted online anonymously. There are now at least 98 similar sites at universities and high schools, most of them in Canada and the U.S. The Facebook compliments craze was started in September by four students at Queens University in Ontario, Canada as an antidote to cyber-bullying and a way to spread joy across campus. The women who founded Queens U. Compliments have since started a hub page for all compliments groups, of which there are now 98, most of them in Canada and the U.S. Speaking with Time’s Techland blog, Queens U. Compliments co-founder Rachel Albi likened the page to the 2000 movie, "Pay It Forward," about an 11-year-old boy who starts a goodwill movement in which people do favors for people who, in turn, do favors for others. The compliments forums could have a “contagious effect in a positive sense,” Glenn Stutzky, an instructor at the School of Social Work at Michigan State University, told the Detroit Free Press. 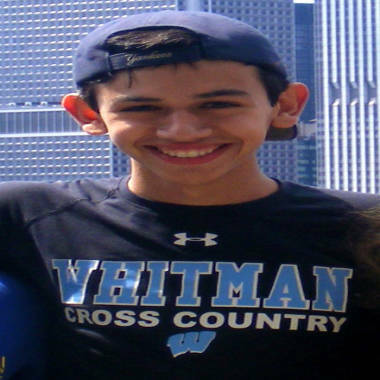 Eyal Hanfling, a senior at Walt Whitman High School in Bethesda, Md., was inspired to create the Facebook page, "Whitman Compliments." Hanfling said there has been cyber-bullying at his school, but few turned up in submissions to Whitman Compliments. “I was really worried that people would take advantage of the system and write horrible things about their classmates and peers,” he told NBC News. But of the 1,500 comments or so submitted over four days, just four or five were unkind, he said. Only one used a curse word. "This is an appreciation post dedicated to your hair. Let us all marvel its beauty." "Youre the only person I know who can run a 5K with a smile on their face. Your style is impeccable and it looks like you're always swaggin out. You're there in the hard times and the great times and just an amazing friend who I am always happy to be around." "you're one of the sweetest guys I've ever known. We grew so close last year and I love talking to you because you're such a genuine listener. You're an incredibly strong person and I really admire that. Never change! You're amazing." When was the last time we complimented a random person in one of our classes? When was the last time we actually wished a random athlete “good luck” in the hallway before their game or congratulated someone on their victory at a tournament? Friends can “like” online posts, but real-life conversations are always more meaningful. After the column was published online, Hanfling enjoyed momentary stardom. He walked into a classroom and received a standing ovation. At a hockey game, he was given a similar reception. And while he hopes his classmates compliment each other in person now, there was another reason Hanfling curtailed the Facebook page: homework. For the four days that Whitman Compliments existed, Hanfling dedicated his evenings, from 5 p.m. to midnight, to the forum. “I do not have enough hours in my day to copy and paste so many compliments,” he said.